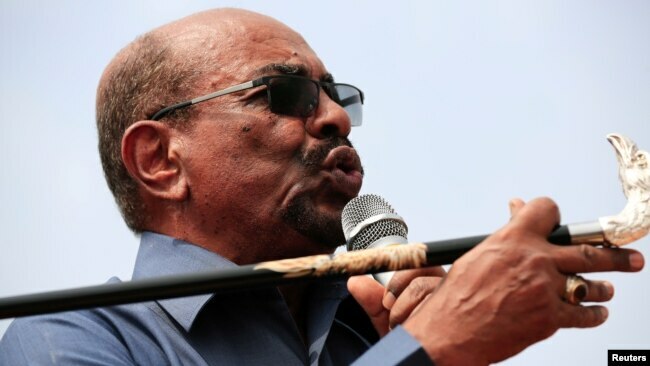 Addressing soldiers in January, Bashir, a 75-year-old former paratrooper who seized power in a bloodless coup in 1989, warned the “rats to go back to their holes” and said he would only move aside for another army officer, or at the ballot box. 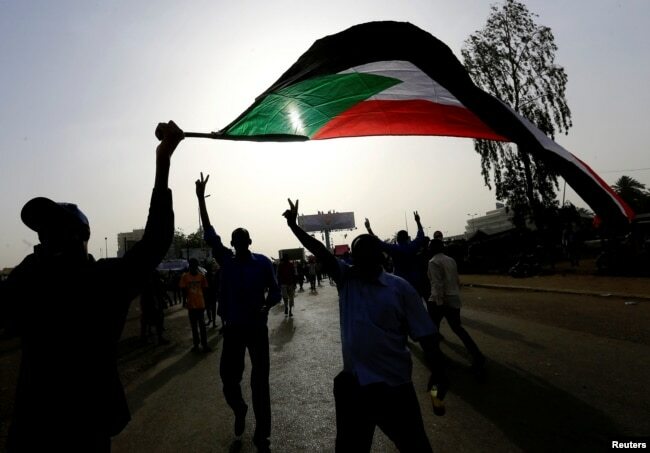 Sudanese demonstrators wave their national flag as they arrive for a protest rally demanding Sudanese President Omar Al-Bashir to step down outside the Defense Ministry in Khartoum, Sudan, April 11, 2019. Since taking office in what was then Africa’s largest country, he fought a protracted civil war with southern rebels, which ultimately ended with the secession of South Sudan in 2011, and the loss of more than 70 percent of Sudan’s oil. 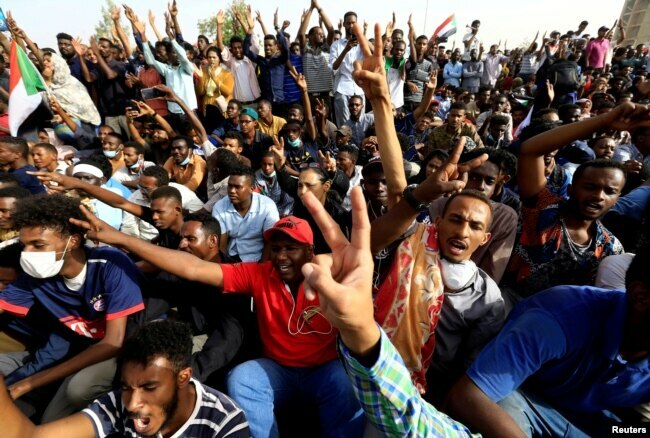 Sudanese demonstrators cheer as they attend a protest rally demanding Sudanese President Omar Al-Bashir to step down outside the Defense Ministry in Khartoum, Sudan, April 11, 2019. FILE - Sudanese President Omar al-Bashir arrives at the promulgation of Kenya's New Constitution at the Uhuru Park grounds in Nairobi, Aug. 27, 2010. 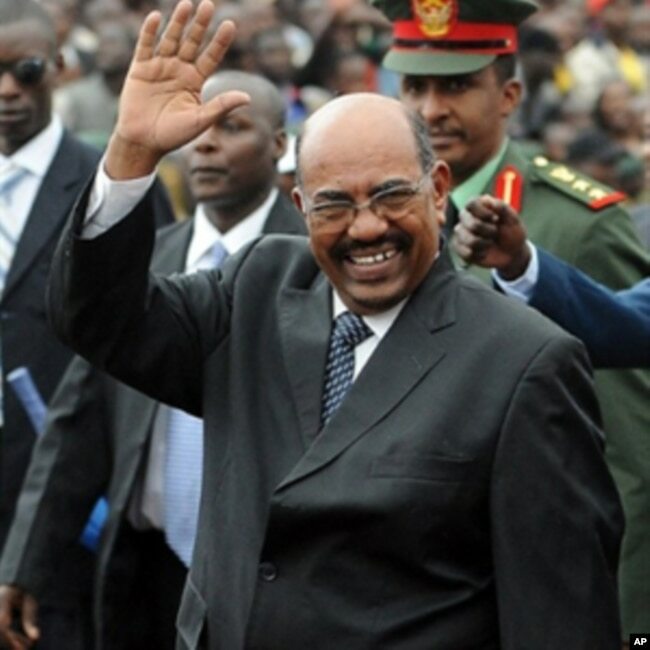 After graduating from Sudan’s military academy in 1967, Bashir served in the Sudanese contingent dispatched to Egypt to help in the war of attrition against Israel that began following the Six Day War in 1967. Bashir has also courted Turkey and Russia, at the same time as Khartoum stepped up security cooperation with Washington, hoping to speed up the country’s emergence from decades of U.S. sanctions that were lifted in 2017.